Web LinksWebsiteTwitterInstagramMember DetailsVeronica Falconieri is a Certified Medical Illustrator specializing in medical, molecular, cellular, and biological visualization. MA, Medical & Biological Illustration, Johns Hopkins University School of Medicine. 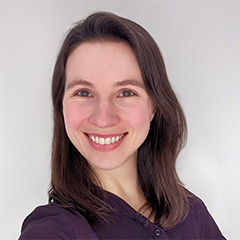 Veronica is Falconieri Visuals' primary animator and illustrator, providing effective and engaging visuals and scientific visualization expertise for her clients. She also collaborates with researchers in the High Resolution Electron Microscopy Lab of the National Cancer Institute, and is a published author in several journals including Science and Cell. As a Certified Medical Illustrator, Veronica illustrates and animates all things medical and scientific, including anatomy, surgery, pathology, cell and molecular biology, physiology, neuroscience, biotechnology, engineering, physics, and general science. Her research experience provides exceptional knowledge of protein structure and understanding of complex molecular subject matter.